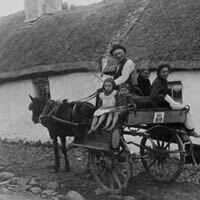 Irish Citizenship - Are you entitled through your ancestors ? Are you entitled to Irish citizenship ? If your ancestors were born here on the Emerald Isle, you may be entitled to what is called “Irish citizenship through Descent”. At Irish Emigrant Trails, we can assist you with your research in this area and set you on the right road to becoming an Irish Citizen. More information on this can be found on the Irish Citizen’s Information Board site which provides comprehensive details on “Citizenship through Descent”. If one of your grandparents is / was an Irish citizen but none of your parents was born in Ireland, you may become an Irish citizen. You will need to have your birth registered in the Foreign Births Register. If you are entitled to register, your Irish citizenship is effective from the date of registration. The Irish citizenship of successive generations may be maintained in this way by each generation ensuring their registration in the Foreign Births Register before the birth of the next generation. Contact us for your free assessment ! What if I am not entitled to Irish citizenship ? If you are not successful in your journey to becoming an Irish citizen, see our information on the Irish government’s “Certificate of Irish Heritage”, which aims to honour those Irish family links throughout recent history.